The emerging contours of the new world of work in the Fourth Industrial Revolution are rapidly becoming a lived reality for millions of workers and companies around the world. The inherent opportunities for economic prosperity, societal progress and individual flourishing in this new world of work are enormous, yet depend crucially on the ability of all concerned stakeholders to instigate reform in education and training systems, labour market policies, business approaches to developing skills, employment arrangements and existing social contracts. Catalysing positive outcomes and a future of good work for all will require bold leadership and an entrepreneurial spirit from businesses and governments, as well as an agile mindset of lifelong learning from employees. The fundamental pace of change has only accelerated further since the World Economic Forum published its initial report on this new labour market—The Future of Jobs: Employment, Skills and Workforce Strategy for the Fourth Industrial Revolution—in January 2016. With an increased need for tangible evidence and reliable information from the frontlines of this change, this new edition of the Future of Jobs Report once again taps into the collective knowledge of those who are best placed to observe the dynamics of workforces—executives, especially Chief Human Resources Officers, of some of the world’s largest employers—by asking them to reflect on the latest employment, skills and human capital investment trends across industries and geographies. 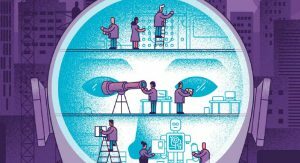 A particular focus of this new edition of the report is on arriving at a better understanding of the potential of new technologies, including automation and algorithms, to create new high-quality jobs and vastly improve the job quality and productivity of the existing work of human employees. As has been the case throughout economic history, such augmentation of existing jobs through technology is expected to create wholly new tasks—from app development to piloting drones to remotely monitoring patient health to certified care workers—opening up opportunities for an entirely new range of livelihoods for workers. At the same time, however, it is also clear that the Fourth Industrial Revolution’s wave of technological advancement is set to reduce the number of workers required for certain work tasks. Our analysis finds that increased demand for new roles will offset the decreasing demand for others. However, these net gains are not a foregone conclusion. They entail difficult transitions for millions of workers and the need for proactive investment in developing a new surge of agile learners and skilled talent globally. To prevent an undesirable lose-lose scenario— technological change accompanied by talent shortages, mass unemployment and growing inequality—it is critical that businesses take an active role in supporting their existing workforces through reskilling and upskilling, that individuals take a proactive approach to their own lifelong learning and that governments create an enabling environment, rapidly and creatively, to assist in these efforts. Our analysis indicates that, to date, many employers’ retraining and upskilling efforts remain focused on a narrow set of current highly-skilled, highly-valued employees. However, in order to truly rise to the challenge of formulating a winning workforce strategy for the Fourth Industrial Revolution, businesses will need to recognize human capital investment as an asset rather than a liability. This is particularly imperative because there is a virtuous cycle between new technologies and upskilling. New technology adoption drives business growth, new job creation and augmentation of existing jobs, provided it can fully leverage the talents of a motivated and agile workforce who are equipped with futureproof skills to take advantage of new opportunities through continuous retraining and upskilling. Conversely, skills gaps—both among workers and among an organization’s senior leadership—may significantly hamper new technology adoption and therefore business growth. At the World Economic Forum’s Centre for the New Economy and Society, we provide a platform for leaders to understand current socio-economic transformations and shape a future in which people are at the heart of economic growth and social progress. A significant portion of our activities aim to support leaders in managing the future of work. This biannual report provides a five-year outlook based on the latest thinking inside companies and is designed to inform other businesses, governments and workers in their decision-making. Additionally the Centre is working across multiple industries to design sector-level v roadmaps to respond to the new opportunities and challenges of managing workforce transitions. The Centre is also supporting developed and emerging economies in setting up large-scale public private collaborations to close skills gaps and prepare for the future of work. Finally, the Centre acts as a test bed for early-stage work at the frontier of managing the future of work, ranging from the development of new principles for the gig economy to the adoption of common skills taxonomies across business and education. We would like to express our appreciation to Vesselina Ratcheva, Data Lead, Centre for the New Economy and Society; Till Alexander Leopold, Project Lead, Centre for the New Economy and Society; and Saadia Zahidi, Head, Centre for the New Economy and Society for their leadership of this report. Additional thanks to Genesis Elhussein, Specialist, and Piyamit Bing Chomprasob, Project Lead, for their work on the report’s survey collection phase, and the support of other members of the Centre for the New Economy and Society team for its integration into a comprehensive platform for managing workforce change. We greatly appreciate, too, the innovative data collaboration with LinkedIn and the support of the report’s regional survey partners, which enhanced its geographical coverage. Finally, we continue to count on the proactive leadership of the Stewards and Partners of the System Initiative on Shaping the Future of Education, Gender and Work under the umbrella of the Forum’s Centre for the New Economy and Society. Workforce transformations are no longer an aspect of the distant future. As shown in the five-year outlook of this report, these transformations are a feature of today’s workplaces and people’s current livelihoods and are set to continue in the near term. We hope this report is a call to action to governments, businesses, educators and individuals alike to take advantage of a rapidly closing window to create a new future of good work for all.